The ADE Diamond series Speed Sights are basically a 3 dot sight system. But instead of the traditional 3 dots the Speed Sights use 3 Diamonds instead. When you use the pistol you line up the diamonds and you instantly know if you are aiming true. If the tips of the diamonds are in line you are level and centered ready to take your shot. The Speed Sights are offered with several options for high visibility and customization including White, Blaze Orange and Bright Green. 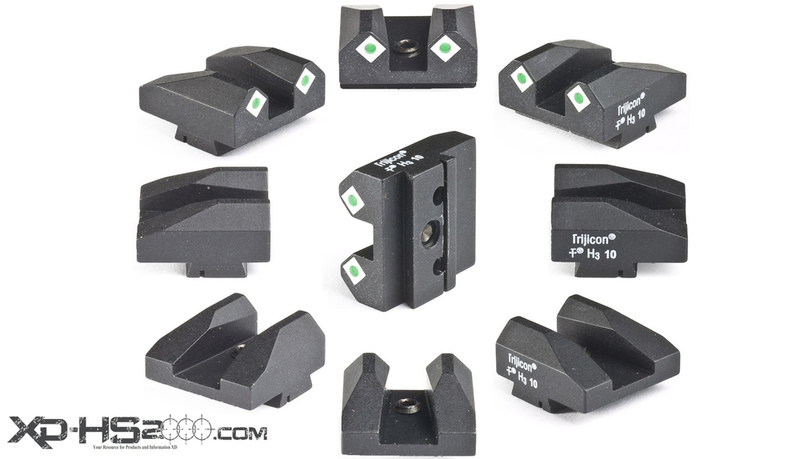 The sights are also offered with or without high quality Trijicon brand Tritium night sight vials. It may seem weird at first that the Speed Sights use diamonds to aim. If you think about it all they are is a slightly modified three dot system like everyone has used for years but with some benefits. Since the front sight is tapered instead of squared off when you aim you see around the front sight and can see more of your target and actually see the bullseye. The tip creates a very fine and accurate aiming point instead of covering the target like a traditional type sight. The second benefit is that the you can easily line up the tips of the diamonds making them very accurate to use. Since ADE employs brightly colored diamonds they are easy to pick up even in lower light. Having several options makes it easy to order a sight set that is customized to the use and his or her needs. If you have trouble picking up or even seeing your sights the Diamond Speed Sights need to be on your list to check out. 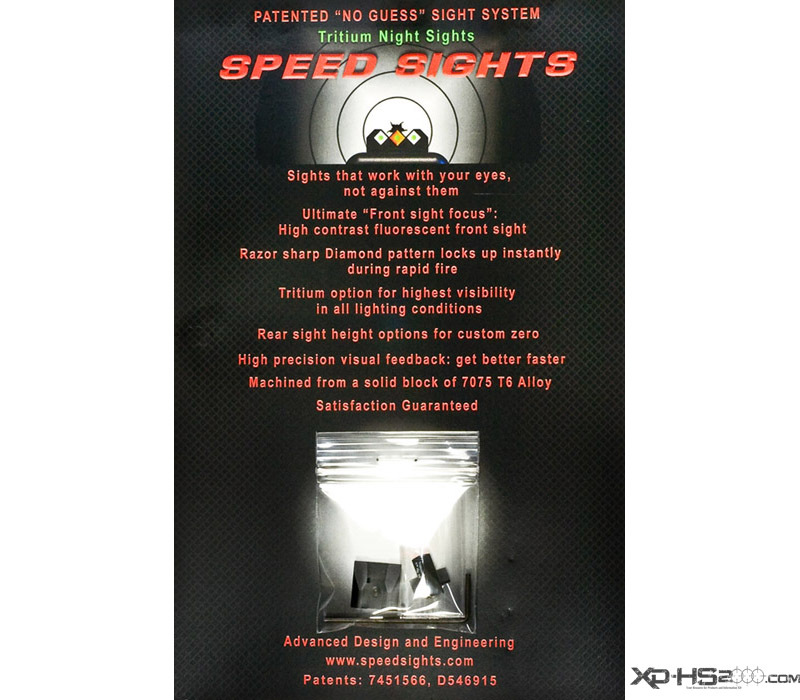 The Speed Sight Light test, both the Blaze Orange and Bright Green are tested against a white outline night sight. Speed Sights come packaged in a zip lock type bag. Included are the card stock packaging insert, front and rear sight, set screw and an allen wrench. If you purchase the Tritium night sight version you can check how old they are by looking at the date of manufacture printed on the sights. If you loose the provided allen wrench you can get a replacement 1/16th inch wrench at your local hardware or automotive parts store. A 360 view of the orange Tritium version front Speed Sight. A 360 degree view of the front speed sight. This is the blaze orange version with Tritium night sight inserts. Notice that the front sight is stamped with white writing indicating that Trijicon manufactured the tritium night sight vials. T & H3 are the symbols for Tritium the radioactive isotope of hydrogen. Followed by 2 numbers indicating the year of manufacture 2010. A speed Sight rear with Tritium inserts. A 360 degree view of the rear speed sight. This version features white high visibility diamonds with Tritium night sight inserts. The white stamping is the same as described for the front sight. Notice that the rear sight utilizes a set screw to help hold it secure in the dovetail of your pistol. The rear sight also employs a relief cut out visible on the bottom of the rear sight. This cutout allows for a snug fit in the dovetail but has some "give" making the rear sight easy to install even in tight dovetails. The sights installed on an XD Tactical slide. If you found this article helpful please consider helping us grow the website by visiting our store. Consider us for your next sight install or refinish.